Emily Grise – a poet and native of Lexington, KY – is working toward her MFA at the University of Missouri – St. Louis. She teaches composition at UMSL’s Pierre Laclede Honors College and reads for WomenArts Quarterly, a St.Louis-based journal featuring work by women writers and artists. “Lazarus Speaks from the Tomb” was composed in a notebook whose cover features a cigarette-smoking monkey in a three-piece suit – a phenomenon which Emily enjoys but doesn’t altogether condone. The Bible is full of poetry and the Gospel according to John is among its most lyrical books. But it is also an official history, a status quo, which is something artists and poets have long challenged. Why is the story so clear that Jesus stayed away? Why wasn’t Lazarus upset with his friend? 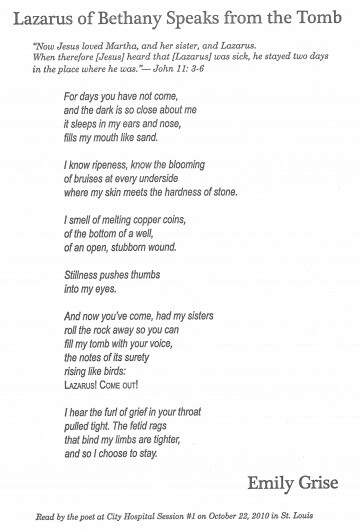 This poem reminds us that Lazarus was human before he was a saint. What could be more human than refusing to cooperate? Even Jesus, according to Christian teaching, is simultaneously human and divine. Does he stay away to make sure his miracle has enough drama? That would be a very human thing to do, too. Or maybe their actions are a guide for how to transcend our baser instincts. However you read it, this poem will help you better know your own mind. The key to the design of this page lay with the choice of Arial Narrow Italic for the body. Its spare, pared down style matches Lazarus’s state as we encounter him inside the tomb. It feels austere, a fitting texture for the voice of a dead man and a counterpoint to the lush imagery of his words. The gentle, rounded serifs of Century Schoolbook Italic, used for the verse from John’s Gospel, provide a distinct contrast to the body of the poem. Plantagenet Cherokee has a similar style to Century Schoolbook; it suggests this poem is a cousin to official narrative.